On this page I am sharing some free printable cards for this fun baby shower game called How many Baby Songs can you name? This is a fun game and you can challenge your guests to write down as many songs with the word 'baby' in the title as they can. I have made this printable game in three different colors. You can choose and print it in the color of your choice. How to Play: Print and distribute these How many Baby Songs can you Name? Game cards among the guests along with a pencil or pen. Set the timer on your phone to 3 minutes. Ask the guests to write down the names of all the songs that they know with the word 'baby' in the title. The person who comes up with most names within 3 minutes will be the winner. Get this fun game for your girl Baby Shower party and it will cost you just ink and paper. Just click on the image given above and save the bigger image in your computer. 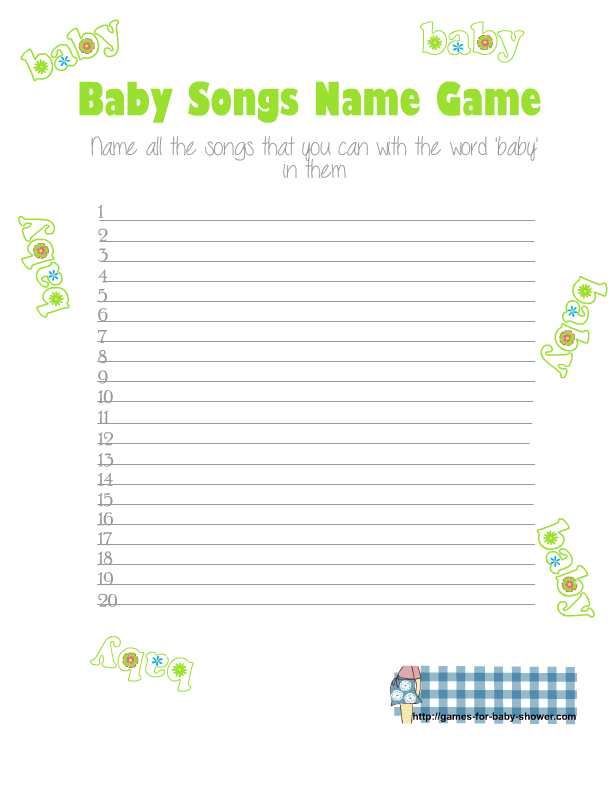 Print as many copies as you want according to the number of your Baby Shower party and challenge your guests to name as many songs with the word baby in the title as they can. 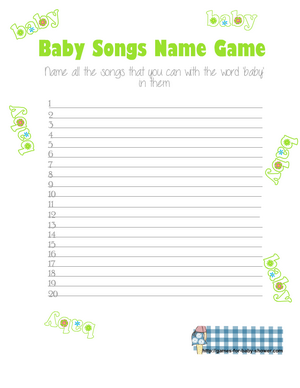 This is another fun free printable for this Baby Songs Name Game. This cute game card has 20 lines and it is decorated with the word baby written in blue color. Just click on this thumbnail image and a bigger image will open up, right click and save that. This is another color for this free printable baby shower game. This adorable green color will go with any baby shower theme. Just click on the thumbnail and a bigger image will open up. You can either save it or print it.